The Prevention Management Organization of Wyoming is the state leader in prevention efforts surrounding alcohol, tobacco, other drugs, suicide and chronic disease. Their dedicated team of Community Prevention Professionals have found that time and time again, one of the most effective ways to aid in this prevention is to educate the public. When real moms, dads, and even teens in our community are armed with the knowledge and resources to help a person in crisis true change can happen. 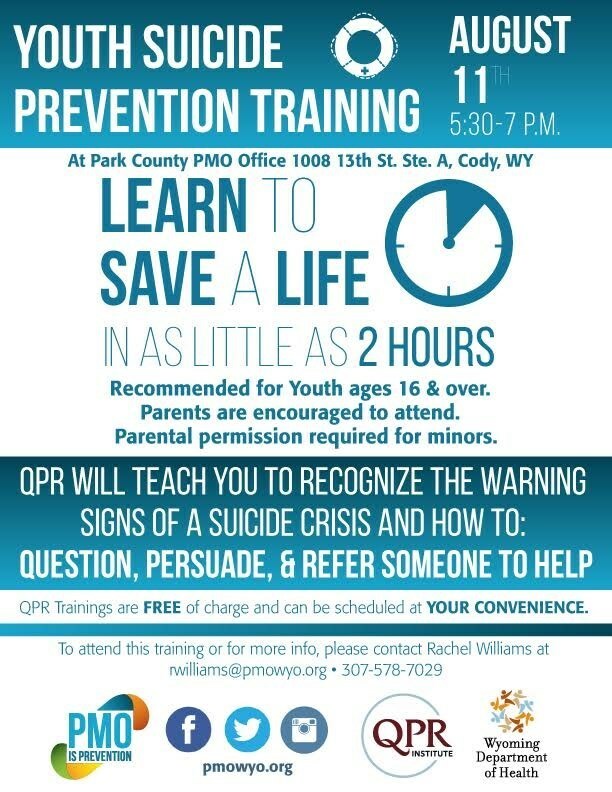 PMO Park County is now offering a Youth Suicide Prevention Course, designed to provide teens, ages 16 and up, with the information and resources to help those in their circle of influence; friends, siblings, and classmates. Parents are encouraged to attend. During this training participants learn how to save a life in as little as 2 hours. QPR will teach you to recognize the warning signs of a suicide crisis and how to: question, persuade, and refer someone to help. These skills are vital and can make a lasting impact on the lives of our youth.